From Monterey Bay, California to Laguna Manuela, Mexico. Also throughout the Gulf of Mexico. Navanax inermis is probably the largest aglajid growing to at least 22cm in length. It is dark brown to black with a pattern of cream to yellow longitudinal lines, sometimes broken, and sometimes replaed by a close pattern of spots. The parapodia have an orange line along the edge, and an inner line of bright blue spots or dashes. The pallial lobes at the back of the posterior shield are relatively large and taper to a point. 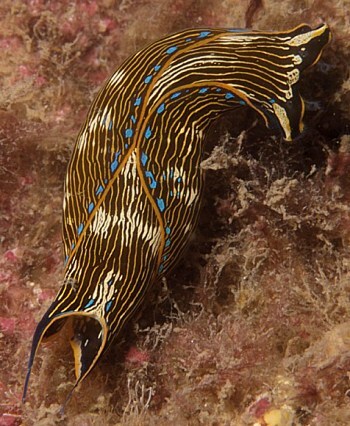 In nature, Navanax inermis feeds on other sea slugs - such as bubble shells and sometimes nudibranchs. On rocky shores it tends to feed on nudibranchs such as Hermissenda crassicornis, Polycera atra and Dirona picta, while on sheltered muddy or sandy bottoms it feeds on bubble shells such as Haminoea virescens and Bulla gouldiana. Dr Rhanor Gillette's lab has a movie showing Navanax inermis feeding on an aeolid. This shows that like the aglajid genera Melanochlamys and Chelidonura, it feeds by using the buccal bulb as a suction pump. See also Bill Wright's message #16251 reporting Navanax eating Aplysia californica. • Cimino, G., Crispino, A., Sodano, G. & Spinella, A (1987) Alchilpiridine ed alchilbenzeni da Opistobranchi Bullomorfi: composti relazionati ai feromoni di allarme del Navanax inermis. Atti del XVII Convegno Nazionale della Divisione de Chimica Organica, Societa Chimica Italiana. • Fenical, W., Sleeper, H.L., Paul, V.J., Stallard, M.O. & Sun, H.H. (1979) Defensive chemistry of Navanax and related opisthobranch molluscs. Pure and Applied Chemistry, 51: 1865-1874. • Leonard, J.L. & Lukowiak, K .(1984) An ethogram of the sea slug, Navanax inermis (Gastropoda, Opisthobranchia). Z Tierpsychol, 65: 327-345. • Leonard, J.L. & Lukowiak, K. (1985) Courtship, copulation, and sperm trading in the sea slug, Navanax inermis (Opisthobranchia: Cephalaspidea). Can. J. Zool., 63: 2719-2729. •Paine, R.T. (1963) Food Recognition and Predation on Opisthobranchs by Navanax inermis. The Veliger, 6(1): 1-9. •Paine, R.T. (1965) Natural History, Limiting Factors and Energetics of the opisthobranch Navanax inermis. Ecology, 46(5): 603-619. • Rudman, W.B. (1974) A comparison of Chelidonura, Navanax and Aglaja with other genera of the Aglajidae (Opisthobranchia, Gastropoda). Zoological Journal of the Linnean Society, 54(3): 185-212. • Sleeper, H.L., Paul, V.J. & Fenical, W. (1980) Alarm pheromones from the marine opisthobranch Navanax inermis. J. Chem. Ecol., 6(1): 57-70. • Sleeper, H.L. & Fenical, W. (1977) Navenones A-C: Trail breaking alarm pheromones from the marine opisthobranch Navanax inermis. Journal of the American Chemical Society, 99: 2367-2368. • Spinella, A., Alvarez, L.A., Crispino, A., Marin, A., Villani, G. & Cimino, G. (1992) Chemical signals in some Cephalaspidean molluscs. Abstracts, 11th International Malacological Congress, Siena 1992: 289-290. Might this be Navanax inermis?